Ducati, a leading motorcycles brand, yesterday (October 20) opened its new state-of-the-art showroom in Dubai, UAE. The showroom is located at Sheikh Zayed Road Exit 40, and the company also unveiled its latest Superbike brand, the ‘100 per cent Italian’ Panigale V4 Speciale during a special ceremony. Revolution Accessories, the official distributor of Ducati in the UAE and a company owned by Abu Dhabi-based Al Masaood Group, marked the opening of the 4,000-sq-m showroom in a special event held in the presence of Ducati guests and fans from UAE and prominent Ducati riders from Italy, said a statement. Visitors admired and enjoyed the range of display of the latest model of Ducati bikes and an exclusive range of merchandise, riding equipment, parts, accessories and other products, it said. They also had the opportunity to take some exclusive demo rides while lucky visitors got the chance to win prizes during the raffle draw, it added. The Panigale V4 Speciale is displayed in the UAE showroom for the first time, Ducati’s Superbike brand hailed for its ‘100 per cent Italian’ character in terms of performance and quality. The Panigale V4 is known to demonstrate Ducati’s technology excellence and innovative engineering solutions and is the first mass-produced Ducati motorcycle equipped with a 4-cylinder engine, closely derived from the Desmosedici of the MotoGP. 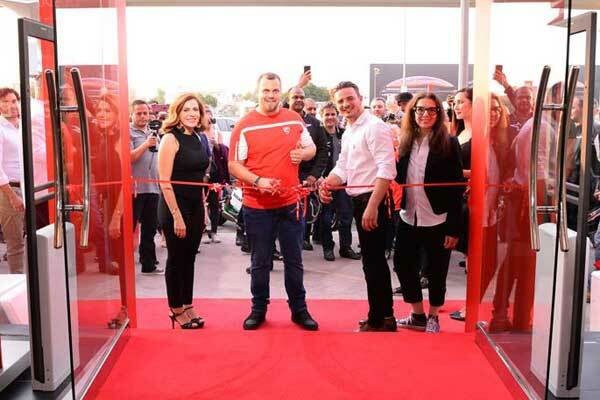 “This new location for Ducati signals the market that we are set to lead the race and become the best motorcycle showroom in the UAE as we continue to innovate and upgrade our service facility adjacent to the showroom,” he said. “The state-of-the-art service centre is matched by highly experienced Ducati technicians and mechanics that were internationally-trained to serve the bikers community in the UAE to ensure the highest levels of customer satisfaction,” he added. “Al Masaood’s leadership in the local automotive sector and strong values on excellence perfectly resonate with Ducati’s which further boost its presence and make it the region’s most loved motorcycle brand,” he said. The new facility accommodates both the Ducati Service Centre and the showroom, which provides greater accessibility for Ducati owners and motorbike enthusiasts to a comprehensive display of Ducati apparel and other products under one location.